Green Day’s latest album, 21st Century Breakdown, (Warner/Reprise) is one of this year’s most eagerly awaited music releases and it more than lives up to the anticipation. Their eighth studio album, and first since 2004’s multi-platinum smash American Idiot, finds the band returning in peak form with the hits “Know Your Enemy” and “21 Guns.” Many have speculated whether or not the band could recapture the success of their previous Grammy Award winning opus, but all of those fears have been put to rest with their latest three-part punk rock opera. 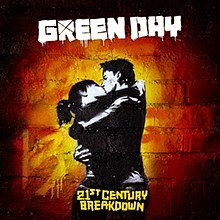 21st Century Breakdown delivers in abundance, clocking in at almost 70 minutes long, and is every bit as good as American Idiot, if not better. The album is co-produced by Green Day and Butch Vig (famous for his work with Garbage, Smashing Pumpkins and Nirvana), instead of their long time producer Rob Cavallo who co-produced their biggest hits. Despite the change in producers, the sound remains true to their usual punk-pop sound with plenty of angst and attitude. Breakdown is a return to the story concept album which follows two main characters named Christian and Gloria through their struggles in the post-Bush era. Throughout their journey, they try to stay together in spite of the tumultuous times they live in, as they find themselves trying to endure violence, economic hardship and city riots. Once again, Green Day has chosen to draw from the current state of events and incorporates them into the lyrics, which are told from the main characters’ points of view. Unlike American Idiot, this album is divided up into three acts which give the album a very distinct beginning, middle and end. This makes for a more diversified album and gives the listener the feeling that they have heard a complete story and traveled on a journey with the characters. Familiar musical themes are repeated throughout which have been designated to each of the characters, much in the same way John Williams did with his score in the Star Wars movies. The album’s lyrics provide vivid images that almost allow the listener to visualize the action as it unfolds in each song. With its ebb and flow balanced with up tempo tracks and melodic ballads, 21st Century Breakdown is another powerful and consistent offering that could very well be called Green Day’s ultimate masterpiece. At the very least, it leaves us wondering what they will come up with next. Hopefully, we won’t have to wait another five years until we find out. Country newcomer David Nail’s MCA Nashville debut, I’m About To Come Alive seems to be finally getting some well-deserved attention. At a time when the music industry is more interested in turning out paint-by-number hit singles instead of investing in career artists, Nail’s collection of non-traditional country songs is more than just a little refreshing. No, this isn’t your daddy’s country music, but instead it is a fresh take on contemporary country. The highly anticipated album has a warm, inviting feeling that makes you want to crank up your car stereo and go on a road trip, while letting the real world melt away as the lyrics blur the lines between fantasy and reality. This is not merely a random selection of songs trying to become digital downloads, but rather an excellent and inviting wealth of material that takes the listener on a sonic journey. It is an album to be listened to in its entirety from beginning to end. However, that is not to say that there are not singles to found here. The hit “Red Light,” that set country fans ears’ buzzing about this new artist and anxiously awaiting this release is here, along with Nail’s version of rock band Train’s “I’m About To Come Alive,” which served as the lead release and became the album’s title track. Also included is recent hit, “Turning Home,” which recently earned Nail his first Grammy nod for Best Male Country Performance. Nail and producer Frank Liddell (Miranda Lambert, Lee Ann Womack) have crafted a new template for what today’s country artists should strive to achieve, which is to make solid, consistent albums that contain no throwaway tracks. From the smooth opening of “Mississippi” to the Miranda Lambert duet “Strangers On A Train,” and all the way through the closing of Nail’s own heart-wrenching “Missouri,” I’m About To Come Alive not only keeps your attention, but commands it by offering up a balanced mix of ballads and up-tempo tunes. Nail may have taken his own sweet time to deliver one of last year’s best and most solid releases, but just one listen proves it was well worth the wait. If this is any indication of the kind of albums we can expect from David Nail in the future, then he should be making music for a long time to come. Greetings fellow music journalists, enthusiasts, and bloggers. This blog collects my various music musings and published pieces as well as links to their individual locations in cyber space.